Restoration of prehistoric Sardinian statues. 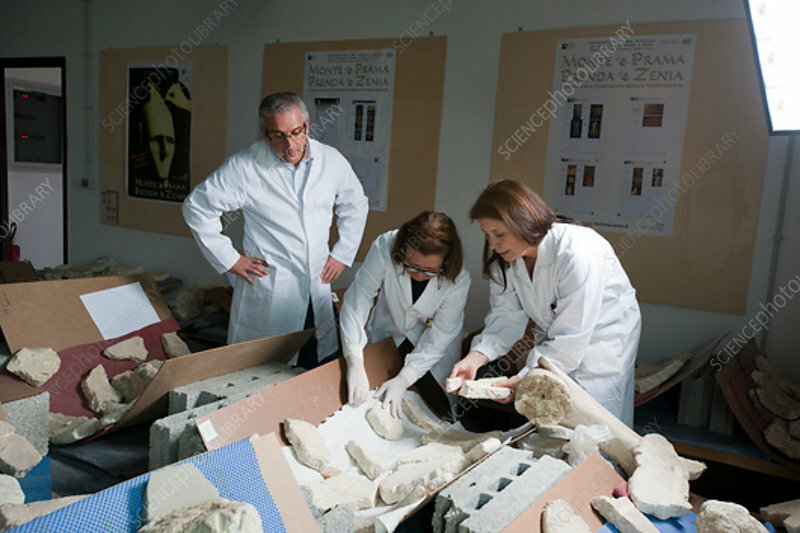 Archaeologists and restorers working on fragments of the shields of the Giants of Mont'e Prama, a set of prehistoric sandstone statues excavated on the Italian Mediterranean island of Sardinia. These statues, found in fragments in the 1970s, date from the Nuragic culture. This culture is known from the 18th century BC, up to the time of the Romans. These statues date from the 11th to 8th century BC. Photographed at the restoration centre at Li Punti, near Sassari, Sardinia.